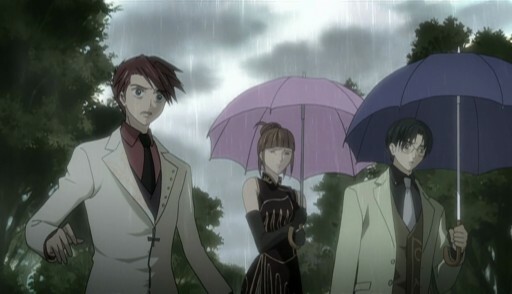 Episode I-II of Umineko no Naku Koro ni, “first move”, begins with dinner for the Ushiromiya family and others, where they discuss from whom Maria may have gotten the umbrella at the end of the previous episode. No one really believes Maria’s claim that it was Beatrice, but no one else admits to giving it to her, either. And there’s no reason to suspect anyone is lying, with the older adults having been talking together, the employees all working in the kitchen, and the doctor having been playing chess with Kinzou. After dinner, Maria takes out a letter with a wax seal marked by the Kinzou’s ring. Everyone is surprised by the apparent letter from Kinzou, although Maria claims that Beatrice had gave it to her the same time as the umbrella to be read after finishing dinner. Of course, they would be unaware that Kinzou had thrown his ring into the sky in the previous episode. Maria starts reading the letter, although she seems to be getting into the witch thing too much and reads it with a scary face (reminds me of evil-mode Rena). The letter is supposedly written by Beatrice, who declares that Kinzou had terminated her long service to the family. With the termination of the contract, Beatrice wants every single gold bar she gave Kinzou back, and she also demands everything of the Ushiromiya family as interest. However, Kinzou managed to include a stipulation that if anyone could expose the location where the gold is hidden, she will forever forfeit the right to collect the gold and payment. The inscription next to her portrait is a guide to the gold, and those who may search for it is not limited to the Ushiromiya family. After hearing the contents of the letter, Klaus and a few other of the older adults demand answers from their father, who as far as they know is the only one who could have written the letter. However, Kinzou ignores them, simply looking forward to the game that is beginning. 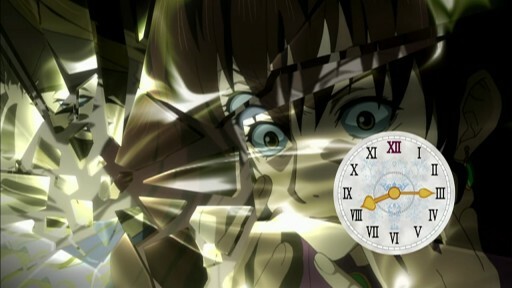 Oddly enough, we are shown a clock that points to 10 o’clock, which is the wrong time not only because this is just after dinner, but because it contradicts the times for later events. 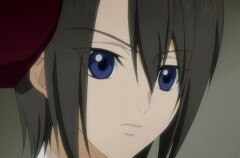 Later, Kirie airs her suspicions to Battler about Beatrice being one of the eighteen people known to be on the island. Her reasoning is that if there was a nineteenth person that wanted to stay hidden, then the person would not have gone to the trouble of handing a letter to Maria and instead would have sent it discretely. Giving the letter directly to Maria must have meant that the person wanted to create the fantasy that there is a nineteenth person on the island. She does acknowledge that it’s not a very strongly supported theory, though. Incidentally, Battler mentions that Kirie often thinks in terms of chess games. Rudolph shows up to summon Kirie so that the older adults can resume their discussions. He also says that if Battler was still awake after the discussions are over, he has something to tell Battler. When Battler wonders about it, Rudolph mentions about probably being killed that night, which alarms Kirie and Battler. Meanwhile, Klaus takes his wife Natsuhi to a locked room, where he shows her a gold bar said to be among the gold that Kinzou received from Beatrice. Natsuhi is shocked to learn that the gold actually exists. The time is 8:15PM. At 9:00PM, Jessica comes across her mother who claims to have a headache. Natsuhi says she would be fine after Jessica offers to find some medication, so Jessica instead gives her mother the scorpion amulet that Maria had given her earlier in the day. For some reason, Jessica seemed uncomfortable while interacting with Natsuhi. Later, the younger Ushiromiyas head to the guest house accompanied by Shannon, where they suggest that they play card games along with Kanon. 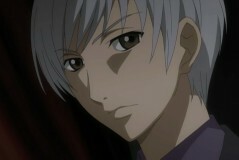 When she goes to find Kanon, though, Genji is also present and informs her about a change in shifts ordered by Klaus. Gouda has the night shift for the mansion, Shannon and Kanon have the night shift for the guest house, and Genji and Kumasawa will be staying at the guest house. After Genji leaves, Shannon asks Kanon about joining the card game, but Kanon says that neither should join because they have the night shift, and also because they shouldn’t mingle too much with the Ushiromiya family. Shannon is doing the rounds and checking the windows, preoccupied by thoughts of George, when she feels a presence behind her but finds nothing. But a glowing butterfly starts flying around as soon as she turns her back. As midnight approaches, Klaus, Rudolph, Kirie, and Rosa are still having a discussion, Gouda is solving a crossword puzzle, Kanon is offering tea to Genji, Chiyo and the doctor are sleeping, Battler, Jessica, and George are playing cards next to a sleeping Maria, Natsuhi is also asleep in bed, and Kinzou seems to playing a solo game of chess. At exactly midnight, a glowing butterfly flies in front of the portrait of Beatrice. It is now 6:00AM the next day. As Kanon and Genji start preparations for the day, Kanon is puzzled by the empty kitchen where Gouda should have been readying things, and the phone also turns out to be dead. Soon after, Natsuhi has woken up, where we see that she had hung the scorpion amulet on the doorknob. This is when Genji knocks on the door and reports that the internal phone lines have been knocked out due to the thunderstorm. He also reports that Gouda is missing and cannot be found anywhere. Natsuhi notices that Genji seems to be bothered by the door, and is shocked to find that the other side of the door is covered with blood. Natsuhi gets some more odd news from Kanon, who reports that not only Gouda is missing, but Klaus, Rudolph, Rosa, and Shannon are missing as well. With Rudolph missing, presumably Kirie is also missing. When Eva and Hideyoshi show up and are asked where they were, they claim that they headed to the bedroom at midnight and suggests that the missing people might be at their father’s study. Genji hands Natsuhi the key to the study so that she can check it out. There seems to be a special significance to Natsuhi being handed the key; it might be a sign of how much Genji respects her. There is no one in the study besides Kinzou, however. Incidentally, when Natsuhi admits that she had received the key from Genji, Kinzou mentions something about him being his friend. Natsuhi informs Kinzou that it is almost time for breakfast, but Kinzou says that he will have breakfast in the study, and only gets angry when Natsuhi tries to convince him to eat with the others. Before Natushi leaves the study, though, he asks her if she ever misses her previous home, to which she determinedly replies that Ushiromiya is all she has. This sounds like there was something dramatic in Natsuhi’s past before her marriage. Kinzou seems to think very highly of Natsuhi and seems to consider her almost as a full-blooded Ushiromiya, even wondering if things would have been better if Natsuhi was the husband and Klaus was the wife. After leaving the study, where Natsuhi informs the curious Eva that the missing people were not at the study, Genji hurriedly arrives to relay a report that something is strange with a locked storehouse. Natsuhi, Genji, Kanon, Hideyoshi, and Eva head over to the storehouse, where the newcomers are shocked by the door being covered with an occult-looking seal seemingly drawn in blood. They will be getting a far greater shock when Kanon opens the door. It doesn’t take long for Genji to summon Nanjo, the doctor whose name has finally been stated in this episode, and the way they hurry out pique the interest of Battler and others. So Battler, Jessica, and George follow Genji and Nanjo, leaving behind Maria who prefers to keep on watching television (which appears to be showing an episode of Higurashi no Naku Koro ni : must be a magic television able to show something from decades later, particularly an anime show that would be far too bloody for a child like Maria (and I’m obviously not being serious)). Despite Natsuhi trying to hide what’s in the storehouse, Battler, Jessica, and George go on to see what’s inside, finding a bloody mess with bodies everywhere. Nanjo infers that they have been dead for over six hours, while Hideyoshi can’t help but note that all of the faces has been completely bashed in. We see the bodies of Klaus, Rosa, Rudolph, Kirie, and Gouda, and while George might have hoped to be spared from as much anguish as Battler and Jessica are going through, it is for naught as one of the body was obscured, with only a hand visible with a ring on her ring finger. There was no narration by Battler in this episode. Presumably now that introductions were done in the first episode, he won’t be narrating to us in any of the other episodes, either. The first instruction from the inscription seems to have been fulfilled (six people dead), and arguably the second to fourth ones were fulfilled as well (George and Shannon split apart, Natsuhi praising the Ushiromiya name, victims’ heads bashed in). The scorpion amulet protected Natsuhi, who was supposed to be a victim as indicated by the bloody door. Shannon was killed, instead. Even if there was no supernatural element to the murders, the killer(s) may have noticed the amulet and avoided Natsuhi to maintain an impression of black magic being involved. Eva and Hideyoshi killed the six people based on the inscription, not in order to find the gold but to use the inscription as misdirection. They are the only ones who we didn’t actually see at midnight, which is shortly before the time the killings occurred. It was to remove competitors for the inheritance, of course, and Shannon was included to stop their son from marrying a mere maid. Natsuhi killed the six people after learning about the gold. Genji giving her the key to Kinzou’s study may have signified the start of the travel described in the inscription. She embarked on this path in order to be recognized as a full Ushiromiya, with how anyone would be allowed to search for the gold. Genji killed the six people with the help of Kanon because he wants to help his dear friend Kinzou with the twisted game. The change in shifts were all for supporting the murders. Rudolph knew much more about the killers and underlying intrigue than he let on. He should have aired his suspicions before heading off to the discussion, even if it was no more than a hunch. I just wonder why Kirie and Battler didn’t grill him more about the “being killed” part. Or did they? His corpse was found inside the storehouse of the rose garden. The direct cause of death is unknown but, it seems the side of his head was destroyed after his death. First of all, it’s the beginning of everything. His face is believed to have been damaged after his death. He has the right to lament his bad luck. Her corpse was found inside the storehouse of the rose garden. Her face is believed to have been damaged after her death. Another meeting is possible. So, no sadness. The side of her head is believed to have been damaged after her death. It’s alright. Everyone will resurrect in the Golden Land. Such a pity. The truth is that it seems he was on duty at the guesthouse. I think it’s ok because we’ve already seen the corpse in the anime. Next time I will post only link then. Oh forget to add, there’s a speculation thread at Animesuki. Feel free to drop in if you would like.